HAPPY 30th ANNIVERSARY TO THE ACORN ELECTRON, ACT APRICOT, APPLE ][e, ATARI 600XL & 800XL, DRAGON 64, MEMOTECH MTX500 and MTX512, MSX, ORIC 1, SPECTRAVIDEO 318 AND 328 COMPUTERS, AND TANDY COLOR COMPUTER 2! Sorry that I haven’t posted any more articles on here recently, but I wanted to check my facts as much as possible, to ward off nitpicking critics like TMR. I’m as satisfied as I can be that all the facts below are more or less 100% accurate, but any slight errors that may exist don’t change the fact that the Commodore 64 is crap!!!! It was in 1983 that (in alphabetical order) Acorn brought out the Electron, ACT released the Apricot, Apple produced the ][e, Atari released the 600XL and 800XL, Memotech released the MTX500 and MTX512, the MSX computers appeared in Japan, Tangerine issued the Oric 1 computer in the UK and Spectravideo released the Spectravideo 318 and 328! Each of these computers had a different type of thinking behind them, but one thing they didn’t have was a 5 or 6 year old version of BASIC! 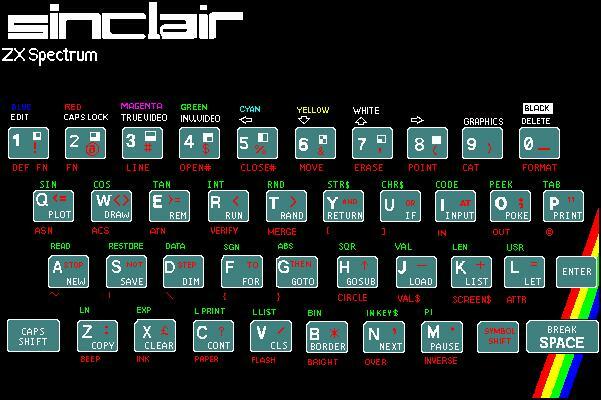 I should also take this opportunity to wish a belated 30th anniversary to the amazing Sinclair Spectrum computer! I never got round to this last year, because I was sidetracked into thinking about the Commodore 64’s 30th anniversary. The Spectrum had a nice, futuristic looking case, because some thought had been given to its design. I’ve already explained how vastly superior its built in custom made BASIC was to the Commodore 64’s ported PET BASIC V2. 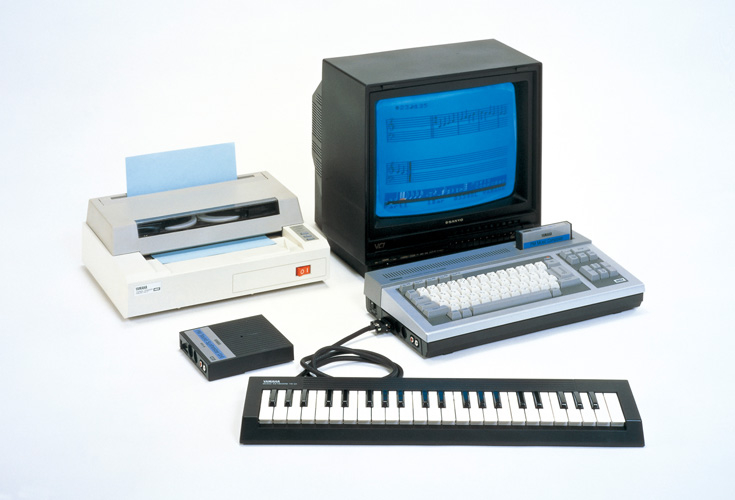 Of course, the Spectrum keyboard was only a rubber calculator type, but Sinclair were following in a tradition of “chicklet” or even totally flat touch sensitive keyboards, which had previously been done by Commodore on their original PET (“chicklet” calculator keyboard), as well as Atari (flat touch sensitive) on their 400 model. The Sinclair ZX80 and ZX81 had flat touch sensitive keyboards. A bit like the Atari 400. People could buy replacement keyboards for the Spectrum, silencing critics like my Dad with his comment of “Word processing. WORD PROCESSING!” and amazingly enough if you typed a program, a text file, or some other kind of file on a replacement Spectrum keyboard, then it could be loaded by any other Spectrum which didn’t have a replacement keyboard fitted. Of course, although the Commodore 64 was totally deficient in its on board BASIC, there was no fix for this which enabled programs written in one of the many extended BASICs to run on a Commodore 64 whose owner hadn’t bought a copy of the same extended BASIC. This was because over the years, Commodore had improved their keyboards, but made no attempt to improve their BASIC! Acorn needed a cheaper version of their excellent BBC Micro to compete in the lower end of the market and this was the Electron. It had fewer chips and interfaces. It had all the same display modes, except the teletext MODE 7. Unfortunately, the sound facilities were also cut down to one channel instead of 3, but I heard that it was somehow possible to use three channels of sound with machine code routines. Of course, you also needed machine code to use more than one channel of sound on the Commodore 64, so I think this means that the Acorn Electron should have been marketed as having three channel sound, then it would have been on my short list and may have been my first computer, instead of the dreaded Commodore 64! ACT released its own Apricot PC after previously importing and marketing the Victor Sirius in the UK. The Apricot PC was distinct in being an early adopter of 3.5 inch floppy disks. It ran MS-DOS and CP/M 86 but wasn’t hardware compatible with the IBM PC. Apple followed up their Apple ][ and Apple ][+ computers with the Apple ][e, where the e stood for enhanced. It could run software for the earlier models, but had an 80 column display, improved motherboard, keyboard, and case, as well as a greatly reduced number of chips. I think I may only have seen the Apple ][e being used, not the earlier models at all. Apple were constantly improving their range of computers since the release of the original Apple ][ in 1977. Atari were involved in a price war with Jack Tramiel’s Commodore, although Atari computers were superior in almost every way imaginable, including the number or colours (256 instead of 16), number of sound channels (4 instead of 3), and the necessary BASIC commands (82 instead of 71) to control these facilities. Unfortunately, they were fighting against an uneducated public, who thought that the Commodore 64 was more or less the same as Atari computers, so they made big efforts to produce cheaper computers, along with a debugged version of BASIC. The result was the 600XL and the 800XL. These computers followed the unsuccessful 1200XL, which had compatibility issues with the earlier Ataris and a limited expansion port, compared with the PBI (Parallel Bus Interface) expansion port on the 600XL and 800XL. 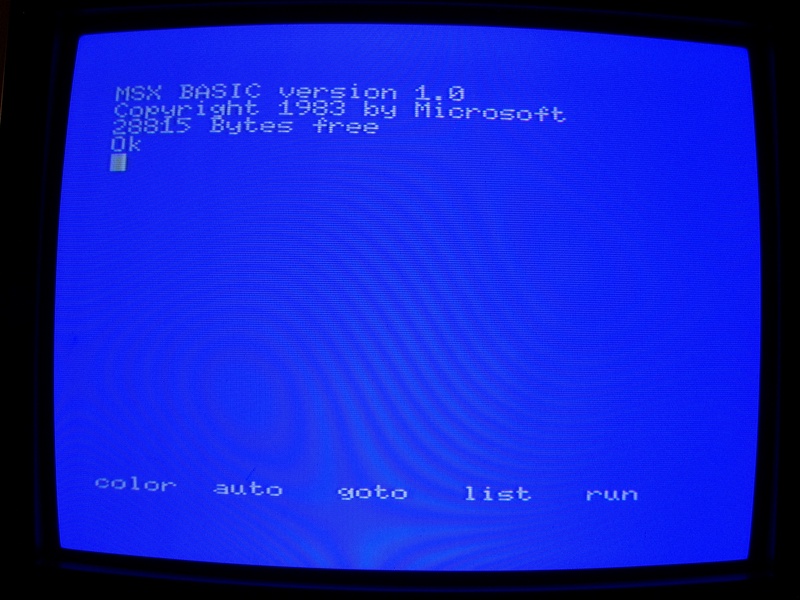 The Dragon 64 followed the earlier Dragon 32, with the same powerful Microsoft Extended BASIC, including the Music Macro Language. It had 64K instead of 32K and could run a system called OS9. This was an advanced OS with limited multitasking for the 6809 CPU, which could also run on at least some models of the Tandy Color Computer. The Memotech MTX512. Later on, Memotech was bankrupted by the USSR Govt! Memotech was a British company which started making peripherals for the excellent Sinclair Spectrum, but then decided to make their own computers with metal cases, high quality keyboards, sprites, 3 or 4 channel sound and the ability to massively expand the RAM even up to 512K, although with the Z80 CPU they chose, this would have required lots of bank switching. They reused the Texas Instruments 9918, 9928, and 9929 (with or without the suffix A) video processor (for various NTSC or PAL TV systems) http://en.wikipedia.org/wiki/Texas_Instruments_TMS9918 , which had appeared in the TI99/4A computer. I even once saw a graphics upgrade for these computers at a computer show, which was approaching photo realism! The BASIC language supplied with the Memotech MTX series was written for those machines and included various commands for colour, graphics, and sound including commands to define and handle the sprites. According to the page http://www.mtxworld.dk/basiccmd.php it had 97 commands.. You can read more about these commands on http://mtxinfo.de/ by clicking on the second link in the list on the left hand side. One of the most powerful commands was GENPAT , which was used to set up sprite definitions. Memotech MTX computers could even display 80 column text in various colours, and run CP/M 2.2 in various colours instead of the usual monochrome display! Unfortunately, they didn’t get the sales or software support they deserved. Memotech was approached by the USSR Government to sell them lots of computers for use in education. Read more about this story below. Some emulators are available from http://www.mtxworld.dk/mtxemu.php . In Japan, a man called Kazuhiko “Kay” Nishi was running a company called ASCII, which then became ASCII Microsoft after signing a deal with Microsoft giving ASCII the rights to Microsoft software in the far east. He looked at what computer hardware was available and put together a collection of what he saw as the best features from various other computers to use as a new standard for home computers to conform to. The end result was very similar to some existing computers and games consoles, such as the Memotech MTX range, the Colecovision console, and the Spectravideo 318 and 328 computers. ASCII had written the BASIC for the Spectravideo range, but all of the other Spectravideo hardware was off the shelf parts which had been used before. They also reused the Texas Instruments 9918/9928/9929 video processor. Kay Nishi combined this tried and tested hardware with a custom written, powerful version of BASIC, which conformed to Microsoft BASIC standard 4.5, and included interrupts such as ON SPRITE, and ON STICK, but didn’t have procedures or long variable names. This meant that MSX users could control most aspects of their machines just by using BASIC, in total contrast to the Commodore 64 which had custom graphics and sound chips but no commands to control them from BASIC! The standard included at least one cartridge slot/expansion port, but many MSX computers had two of these. He was criticised for just copying the Spectravideo 328, but deleting the BASIC commands GET and PUT (also found in Tandy and Dragon BASICs), rewriting the ROM OS routines and altering the cartridge port to claim the intellectual property rights and/or Copyright for ASCII Microsoft instead of Spectravideo, but whether or not you think this is true, he developed a standard system, supported by various manufacturers with lots of software and peripherals available. Memotech claimed he copied the design from their MTX series. The MSX standard was supported by various manufacturers including Canon, Casio, Daewoo, Dragon, Kawai, Fujitsu, Goldstar, Gradiente, Hitachi, JVC, Mitsubishi, National, Panasonic, Philips, Pioneer, Sanyo, Schneider, Sharp, Sony, Spectravideo, Toshiba, Victor, Yamaha, and Yashica. The USSR Government had been negotiating with Memotech to supply them with lots of their MTX computers for use in education, but eventually decided they couldn’t afford it and backed out, which helped force Memotech into bankruptcy. The USSR later bought lots of Yamaha MSX computers for use in education instead. The cartridge/expansion ports made it possible to expand MSX computers in ways usually only seen in more expensive computers with large cases and internal slots, such as the Apple II, IBM PC and clones of these computers. Expansion had previously been available on early computers such as the Altair and homebrew computers which had an S100 expansion bus. Spectravideo also brought out an expansion box which accepted plug in cards for their 318 and 328 computers, but these computers were practically doomed from the start because MSX was announced at about the same time they were released. The MSX expansions weren’t usually fitted internally, but included a full blown Yamaha synthesizer (which WAS internal on Yamaha’s music computers, but could only fit externally on other MSX computers), other less powerful music keyboards, Pioneer video editing hardware, and floppy disk drives not yet designed when these computers launched. These included the officially approved MSX drives with 3.5” MS-DOS formatted disks, running MSX DOS and MSX Disk BASIC, as well as the cheaper Quick Disk models, using smaller disks and a sequential filing system. The Yamaha YIS503 MSX computer, launched in Japan in 1983. This was the precursor of the Yamaha CX5M Music computer. Unfortunately, most of the companies that supported the MSX standard decided to steer clear of the USA, because of the price war led by Jack Tramiel’s Commodore. I think the only MSX computers officially released in the USA were the Spectravideo 728 and the Yamaha CX5M music computer. 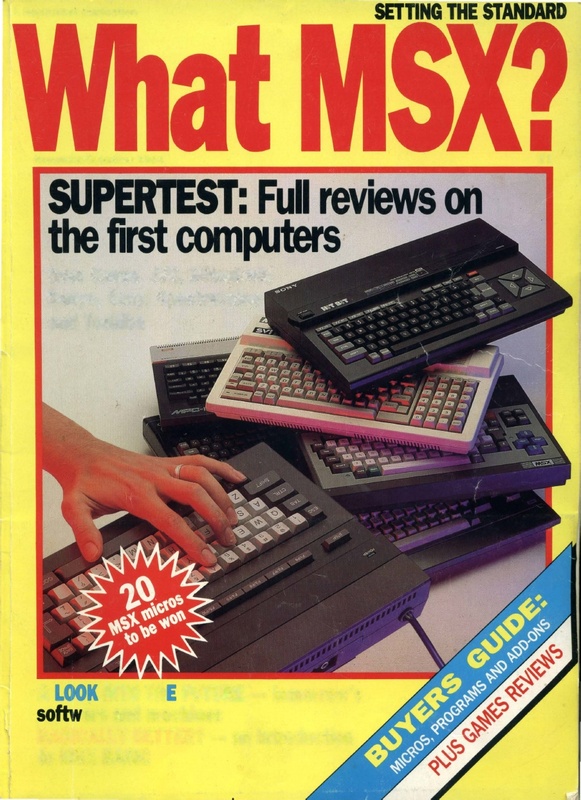 The later, improved MSX2 was never even released in the UK, let alone the USA. A search on eBay reveals that lots of MSX and even MSX2 computers have ended up in the USA, as computer fans and collectors have been keen to discover what Jack Tramiel helped prevent them from knowing about back then. Try an emulator from http://www.emulator-zone.com/doc.php/msx/ . 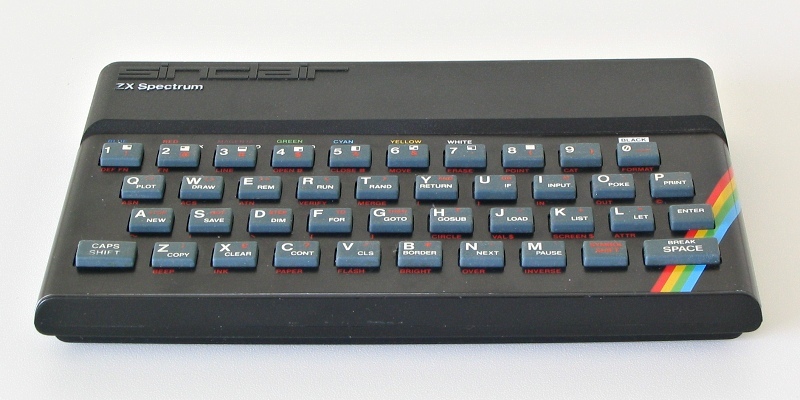 Tangerine was a UK company which had previously released a kit computer called the Microtan 65, which could be upgraded with plug in boards, but then decided to compete with Sinclair by bringing out a new, cheap “home computer” called the Oric 1. I saw at least one at a computer club. This had a keyboard with calculator type keys, but these were hard plastic, instead of the Spectrum’s rubber keys. It also had a nice key click sound when you typed anything on the keyboard, like in all the best cult sci fi, including Doctor Who and Blake’s Seven, although it could be easily turned off with a POKE #26A,10, which the Sinclair Spectrum and Atari also had, but keyboard click wasn’t implemented on the Commodore 64, and neither were Hex numbers in BASIC. It was based round the 6502 processor and had 4 channel sound from the very popular General Instruments 8912 chip, also used by various other manufacturers. It didn’t sell all that many units, capturing about 5% of the UK computer market, but soon became the best selling computer in France, although with less sales than in the UK. It came with its very own advanced BASIC with custom commands, including simple commands such as SHOOT, ZAP and EXPLODE for sound effects. 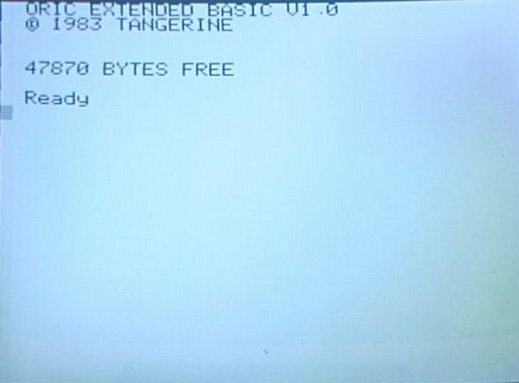 Oric BASIC included various advanced commands, such as CIRCLE, CURMOV (X,Y), CURSET (X,Y), DRAW, HIRES, INK, LORES, MUSIC, PAPER, PATTERN , PLAY, PLOT (X,Y), POINT (X,Y), REPEAT…UNTIL, SCRN (X,Y), SOUND, WAIT (N). The Oric 1 startup screen, showing how Oric BASIC managed to have more RAM free to BASIC than the Commodore 64, with only 48K declared RAM instead of the alleged 64K on the C64! “It’s 64K! He can’t grumble at that” (my Dad). 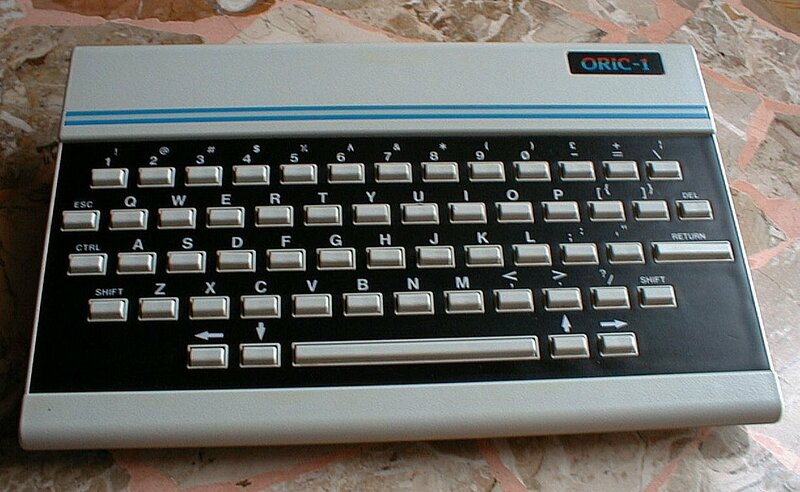 It was followed up by the Oric Atmos, with an excellent keyboard. I think a few French visitors to my computer club had these, or perhaps they had Tandy Cocos. Either way, they didn’t know how lucky they were. Their group leader’s or teacher’s comment of “Commodore soixante quatre!” indicating mine and another unlucky victim’s machines was totally inappropriate and if I’d met them a few months later, I may have asked if they’d like to swap. I once saw an Atmos with a nice new “mini” sized disk drive at a computer show. This disk size was later made popular by Amstrad! An emulator is available from http://code.google.com/p/oriculator/ . Tandy updated their Color Computer by releasing the Tandy Color Computer 2. The silver case was replaced with a white one with a better keyboard and an updated BASIC to go with it. Of course, some other computers were released in 1983, but these were mainly fairly obscure, or nothing to celebrate, such as various IBM PC clones, and the Commodore SX64, which was a portable version of the Commodore 64! A more complete list of these computers can be found on http://www.old-computers.com/museum/year.asp?st=1&y=1983 . That’s all for now. Look out for another article in the near future, where I plan to explore some BASIC programming!